Aishwarya Rai Bachchan is making work look fun, courtesy the million dollar pictures she has shared on Instagram from Paris, where the actress is shooting for Swiss brand Longines' new collection. On Sunday, Aishwarya made some fabulous entries to her Paris diary by adding a sun-kissed picture of herself and in the others, she shares the frame with daughter Aaradhya and mom Vrinda. "Love," Aishwarya captioned one of the pictures with Aaradhya and Ms Rai. 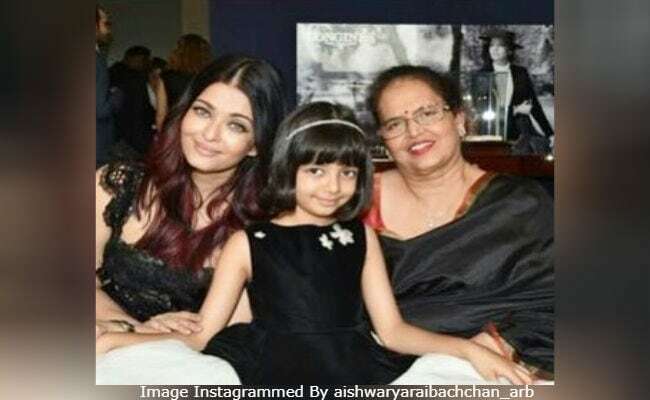 The photos appear to be taken from Saturday's shoot, where Aishwarya wore a stunning black laced outfit and Aaradhya, 6, was pictured in a black-and-white frock. On Saturday, Aishwarya treated us to a beautiful picture of Aaradhya, smiling and playing on a carousel. The doting mom shared it with a superb caption - "My love." Meanwhile, here are some of the other pictures shared by Aaradhya from Paris. Aishwarya and Aaradhya flew out to Paris earlier this week. The actress also shared this selfie with her "super girls" after reaching the French capital. Aishwarya Rai Bachchan debuted on Instagram in May, at the time when she left Mumbai to attend the Cannes Film Festival. From the French Riviera, Aishwarya kept her Instagram followers posted with her whereabouts. From last week's Ambani party, she shared this picture with husband Abhishek and Aaradhya. On the work front, Aishwarya will be next seen in Fanney Khan, also starring Anil Kapoor and Rajkummar Rao. She is yet to finalise Shree Narayan Singh's Jasmine and the remakes of Raat Aur Din and Woh Kaun Thi?.